Okay, I have a good reason for not posting yesterday. Don’t laugh. Okay laugh if you want to, but then hear me out. I got a new planner. In the world of people who are obsessed with such things, there’s a term called “Planner Peace,” in which you’ve found exactly the system you need, the stuff you want to make it pretty, and the containment vessel (binder) and have, for a few months maybe, perfect synergy with your planner. Planner Peace is kind of the White Whale of crazy planner people. But everyone has a list of things they need. My list is a little weirder than the average. I make most of my own inserts, so I can create anything I like and change it week to week. But my real problem is finding the right binder. 3 – They’re almost all made of leather. I don’t do leather. I don’t buy leather bags or shoes; my phone case is PUL (polyeurethane “leather”). The bottom line is that there came a point I was no longer comfortable wearing or carrying around a dead animal’s skin. It makes me uncomfortable. Filofax has soooo many beautiful binders, but I despaired of ever seeing anything but critter skin. 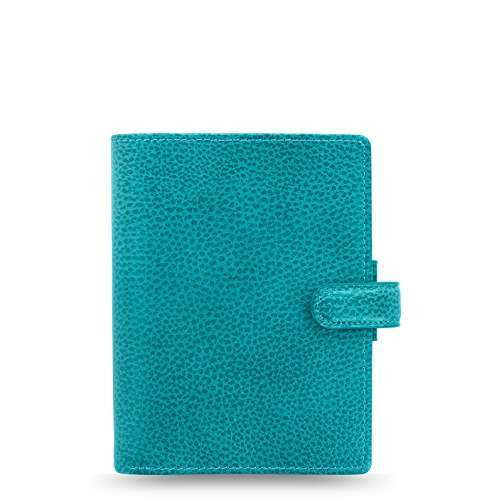 Then, I happened across a YouTube channel by “The Vegan Organizer,” reviewing a Filofax Saffiano – in faux leather. Here she is reviewing the Saffiano, in case you’re curious. 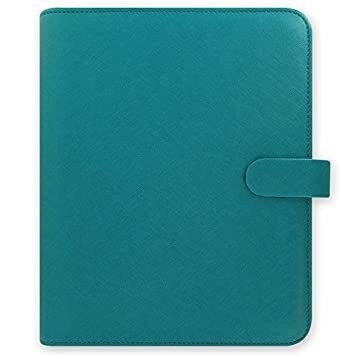 It took some digging about, but I found one on Ebay for a…let’s say reasonable price, in a gorgeous dark turquoise color. So while I should have been taking snapshots of last week’s planner, I was completely redoing my entire system, reprinting calendars and finding ways to adjust things that I’d made and wanted to keep, like the picture of my adopted Farm Sanctuary pig Rosa. I had to take her little folder apart and make a new one, but now she can still ride with me in my pig-free planner. I realize that this kind of fanaticism seems pretty silly to normal people, and hey, it is. But for me, it’s really important. Bipolar disorder has wreaked havoc with my memory, and if I don’t have things written down it’s highly unlikely I’ll remember them. Also, I am lacking in general life enthusiasm, even though my newest med is promising. Being able to gussy up my to do list, make it pretty and make keeping it fun, is a valuable psychological trick that gets my creative side engaged in the practical slog of life. And I’m constantly changing to find ways that work better for me – what’s important for me to track? What will I really write down versus what will I not do and then feel bad for not checking it off? Do I really need a whole section for each day? How do I keep track of my writing goals in my current format? Thank God I don’t have kids. But I don’t think Planner Peace is in the cards for me any more than any other kind of peace. What I’d like is Planner Amity. No system is going to be perfect forever – that applies pretty much across the board in life. You go with what works until it doesn’t anymore, and then you can either dig in your heels and demand that the world reshape itself to fit your needs (which it won’t) or you can reevaluate, consider, and adjust. I’d like to take this opportunity to introduce the newest fun thing in my Tiny Relics Etsy shop: a printable A5 sized planner. It’s aimed toward people with mental health or chronic illness issues, but others could certainly get a lot out of it. The download is 20 pages, and there’s also a 1 page daily planner that’s full letter size. Read all about it here. I would really love one of these planners (or any really nice one) as one who too suffers from bipolar disorder and frequent seizures i’d say my brain is more than rattled at the best of times. I forget important dates and tasks that I would really like to remember. So i’m going to need to find this and some custom pages to put in it. not to mention I will need a faux leather one too since i’m not a fan of carrying around dead animals either. All in all I think this was a great use of your time. In April I thought I found planner peace. Here it is in June and I found a totally different set of printables. Darn.